Juicy astonishing whole grilled chicken with mind-blowing crunchy crust skin, infused with herbs and orange flavors right inside the meat with the special technique we will show you! Very easy yet incredible recipe you must try! Everyone loves this Boki’s first bite, right? Someone tried to steal it…! 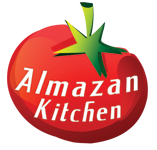 Check out what happened next, everything is in the one video only on AlmazanKitchen! Toss in 1 tsp. of pepper, 50g of sliced ginger, 2-3 garlic cloves and 2 rosemary sticks. Cut off and remove the backbone from the chicken. Rub the bird with salt well. Place the chicken inside the pan on the back, let the skin becomes crispy golden brown. Build the “smoking pit” from the logs around the coals like we did in the video. Put inside handful of fresh sage and snow to the rears.Place the round grill above. Cut the orange into standard slices, place onto the grill. Put the chicken down on oranges. Grill until ready. It looks so tasty and it feels so relaxing! Every video/recipe is a real treat!